The snake had likely escaped from a house close by. 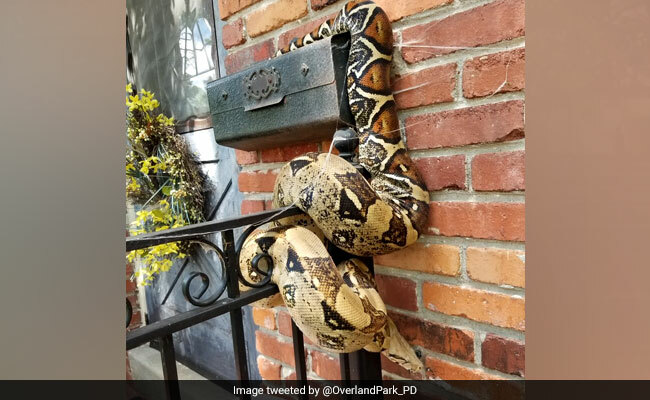 While the tweet says the snake is a Ball Python, Overland Park police later clarified that it was a boa constrictor. "The poor resident did not receive their mail today (obviously)," says the tweet. The snake was reportedly eight-foot-long. Pictures show the snake lounging comfortably on the mailbox and the fence next to it. Another picture shows Animal Control Officers working in tandem to carefully remove the snake from its place. A police spokesman, Officer John Lacy, told The Kansas City Star that the snake had likely escaped from a house close by. They hope its owner would call about of the missing snake soon. Several people have posted comments on the post about the snake. "Has to be someone's pet. It either escaped or they just ignorantly let it go," says one Twitter user. "Whole lot of 'nope! '," says another. How would you react if you spotted a snake like this? Tell us using the comments section.